Tags: alien contact, alternate history, hard science fiction, science politics, SSC, supercollider, time travel, wormholes. Order from Book View Café at : http://bookviewcafe.com/bookstore/?s=Cramer . Note: Only 1,000 copies of the hardcover edition were published by Avon, because the trade paperback was published simultaneously, Therefore the hardcover edition sold out two months after publication, was not reprinted, and has become a collector's item. Here's the first chapter of Einstein's Bridge, as provided by Avon. 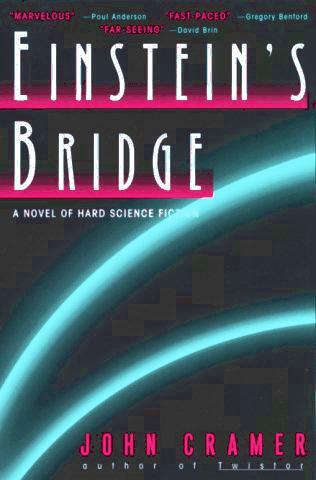 Here's a review of Einstein's Bridge from the SF Site: https://www.sfsite.com/05b/bridge01.htm . Arriving too late for a full review, physicist-author Cramer's latest hard science fiction yarn (Twistor, 1989) begins in an alternate ``bubble'' universe where the Superconducting Super Collider (SSC) project didn't collapse through lack of funding in the 1990s. Instead, in 2004, the search for the elusive Higgs boson begins -- but the operation of the SSC inadvertently sends a signal into another bubble universe, this inhabited by the malignant and utterly ruthless Hive, who colonize new universes by completely obliterating the competition. Fortunately, the benevolent Makers also receive the signal and send a message back alerting Earth to the danger. Cramer splendidly demonstrates just how fascinating and mind- boggling real science can be, and shows exactly how vulnerable basic research is to political whim. Copyright 1997, Kirkus Associates, LP. All rights reserved. This is the listing for Einstein's Bridge from the catalog of Avon Books. An all-new tale of science and suspense that has already been praised by bestselling author David Brin as "an intriguing look into the world of high-tech physics -- and high energy imagination." In 1989, world-renowned physicist John Cramer burst on the science fiction scene with his brilliantly inventive high-tech thriller Twistor. That novel garnered admiration and accolades from SF fans, the science community, and general readers alike for its intriguing plot, rapid-fire pace, and heartstopping suspense. Now Cramer does it again, with an all new high-wire science thriller. It is the year 2004. Two physicists and a writer are drawn together at the site of the giant Superconducting Super Collider -- a particle accelerator recently completed in the Texas outback. When the high-energy experiments produce an unexpected anomaly, they are the first to realize that it is a communication from another universe. Too late, they decipher the warning from an alien life form who informs them that yet another, hostile, intelligence known simply as "The Hive" will also respond to Earth's signals. For, The Hive combs the cosmos, seeking intelligent life, establishing communications and, once it has learned all it can, destroys. An ingenious mix of real-life science and vivid drama, EINSTEIN'S BRIDGE is an edge-of-your-seat voyage through space, time, and imagination. John Cramer is a professor of physics at the University of Washington. He writes the bi-monthly science column for Analog Magazine. He divides his time between his home in Seattle, and Switzerland, where he is involved in work on the particle accelerator at CERN. This is the Einstein's Bridge book jacket from the original Avon hardcover and trade paperback editions (1997). Click on the icon for a larger (25k) image. This is a summary of Einstein's Bridge that was written when the novel was being offered to Avon in 1995. Einstein's Bridge (130,000 words) is a hard science fiction novel about about high energy physics, wormholes, alien contact, time travel, and the killing of the Superconducting Super Collider (SSC) Project. It is set Waxahachie, Texas in the year 2004 when the Superconducting Super Collider, an $8 billion high energy particle accelerator, has just come into operation. The SSC collides two 200 TeV beams of protons, producing concentrations of energy that have not occurred since the early Big Bang. Unknown to the SSC physicists, these collisions produce signals detected by two warring alien civilizations, one benevolent and the other hostile. These aliens are isolated in universes that split off from ours in the Big Bang. They both use wormholes (the "bridge" of the title) to make contact with intelligent life in other universes. The benevolent aliens contact SSC scientists, warn them, and try to help them defend our world from colonization by the hostile aliens, but they are too late. The only remaining way of defeating the alien invaders is to intentionally destroy our own universe - "unravel" it actually - back to a time before the SSC began to operate. Two protagonists are thrown backwards in time to 1987; their mission: to stop the SSC project before history repeats itself. Einstein's Bridge is a "novel of discovery", in that much of the action involves scientific detective work and problem solving. It is a "novel of ideas", because scientific concepts, theories, and ideas are essential to the story. The novel has strong, fully-developed characters which are necessary for this story, but unusual in hard SF. The portrayal of Texas culture and physics culture both come from the author's personal experience. He was born in Houston and lived in Texas for the first 26 years of his life. His portrayal of high energy physics and the SSC laboratory is based on his work in relativistic heavy ion physics at the CERN laboratory, his study of the planning for the SSC, and personal interviews in Waxahachie during the early stages of the SSC project. The last part of the novel is also unusual, perhaps unique in SF, because real events and political actions between 1987 and the present are fictionalized and given new significance and meaning by the plot. The author's portrayal of the inner workings of national politics also comes from personal experience in presenting the case for the value of basic research to members of several Administrations and to members of Congress and their staff. Media reports were studied in detail for the period from 1987, when the SSC project was announced by Reagan, to 1993 when the project was killed by the US Congress. Quotations used on the part number pages are usually taken from Science, Nature, Physics Today, or the American Physical Society's "What's New" electronic newsletter. Einstein's Bridge is John Cramer's second novel. It may be compared to his first novel,Twistor, which received very favorable reviews, was nominated for several awards, and was commercially successful, with SF Book Club and British editions and a new (1996) Japanese edition from Hayakawa. Both works are novels of discovery in which the principal protagonist is a physicist who makes an important and unexpected discovery. Both use scientific problem solving as an important plot element. Both have strong characterization. Both, in fact, involve other universes, but in very different ways. The novels differ in that Twistor was about small-scale condensed-matter physics research in a university laboratory, while Einstein's Bridge is played on the broader stage of national politics and of high energy physics, with its multi-billion dollar accelerators and teams of a thousand physicists working together to discover the inner secrets of the universe.